The Wedding Cake has to be one of the most traditional and symbolic parts of a wedding, besides the wedding gown of course. 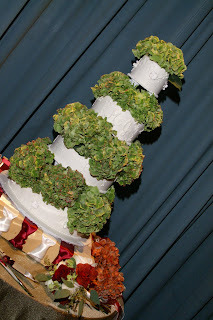 Couples think a lot about the design of the cake and the yummy insides. Some people used to think guests don't eat cake- well I haven't been at a wedding where the cake wasn't delish and the guests either ate it up or took some home. During the days of the Roman Empire, wedding cakes were actually small loaves of bread made of wheat, a symbol of fertility and abundance. The groom would eat a piece of the cake and then break the rest over the bride’s head, thereby showering her with fruitfulness. Guests would then scramble for the crumbs on the floor and eat them, in case the good luck could spread. 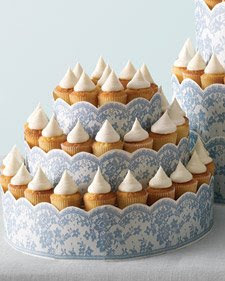 So it doesn't matter if you do a traditional cake, towers of cupcakes or an assortment of pies. They symbolic part is eating with your new husband or wife and then sharing it with your guests.